You are going to Watch Naruto Shippuden Episode 330 English subbed online free episodes with HQ / high quality. 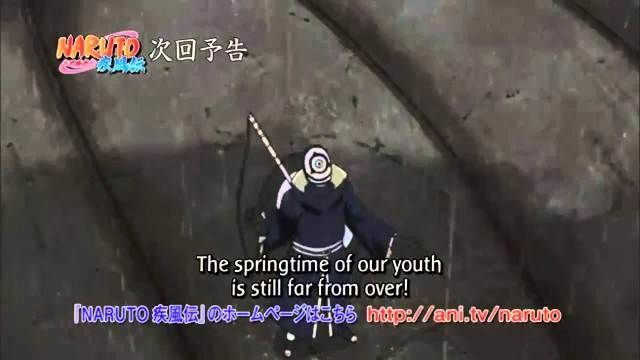 Stream Anime Naruto Shippuden Episode 330 Online English sub The Promise of Victory. Tobi is confused by Naruto’s claim of learning difficult names, which Naruto teases him for. Guy and Kakashi discuss now Naruto’s progress is making them feel old, though not that old. Tobi begins to sweat, but believes it to be the rain that’s starting to fall. Tobi gets a strange feeling from Naruto, and concludes that the war will make everything irrelevant. At the Allied Shinobi’s HQ, Naruto’s use of Kurama’s chakra was felt, though they also feel something else. Ao relays to events to Shikaku, who wants to use it to raise the army’s morale all at once, despite the strain it would cause to communications by Inoichi. Naruto’s friends all rush towards his direction, intent on supporting him. Elsewhere, Sasuke also walks towards the battlefield as a thunderstorm begins.